The 90 islands that make up the city of Amsterdam are divided by canals crossed by hundreds of picturesque bridges. Boats traverse the scenic canals of Amsterdam, flanked by steeply gabled houses and churches topped with spires. Amsterdam is one of the most important commercial centers in Europe. 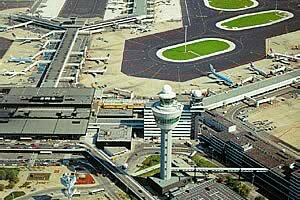 Schiphol airport is located in the northwest of the Netherlands, strategically placed near all of its major cities. As one of the busiest airports in Europe and indeed the World, Schiphol is mostly used for transit between aircraft. It is located in the middle of Western Europe making flights to all of Europe possible in hours.